Historic Monuments of Dengfeng in "The Centre of Heaven and Earth"
Dengfeng (Chinese: 登封; pinyin: Dēngfēng; postal: Tengfeng) is a county-level city under the jurisdiction of Zhengzhou, the capital of Henan Province, China. In ancient times, it was known as Yangcheng (simplified Chinese: 阳城; traditional Chinese: 陽城; pinyin: Yángchéng). 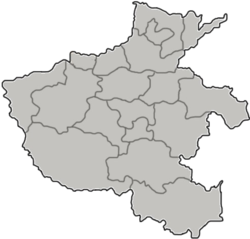 Dengfeng has an area of 1,220 km2 (470 sq mi) and a population of 630,000. It occupies the southwestern corner of Zhengzhou and is its westernmost county-level division. Dengfeng is located at the foot of the Mount Song, one of the most sacred mountains in China. The city is one of the most renowned spiritual centres of China, home to various religious institutions and temples, such as the Taoist Zhongyue Temple, the Buddhist Shaolin Temple, as well as the Confucian Songyang Academy, hence its poetic expression derived from Chinese literature as the spiritual "centre of heaven and earth". The first Xia Dynasty capital Yangcheng was built west of Gaocheng Township on the Yin River under the sacred Mount Song. The famous Shaolin Monastery, traditional origin of Zen, is located in Dengfeng. Wikimedia Commons has media related to Dengfeng. ^ (in Chinese) Introduction to Dengfeng, official website of Dengfeng Government, visited on April 12, 2008.